Unha-3 rocket in the site before launch of Kwangmyŏngsŏng-3. Sohae Satellite Launching Station (Chosŏn'gŭl: 서해위성발사장; Hancha: 西海衛星發射場; MR: Sŏhae Wisŏng Palsajang, also known as Tongch'ang-dong Space Launch Center and Pongdong-ri) is a rocket launching site in Tongch'ang-ri, Cholsan County, North Pyongan Province, North Korea. The base is located among hills close to the northern border with China. The spaceport was built on the site of the village Pongdong-ri which was displaced during construction. It was the site for the 13 April 2012 launch of the North Korean satellite Kwangmyŏngsŏng-3, which was launched to celebrate the 100th anniversary of the birth of Kim Il-Sung. The rocket launch failed, but on 12 December of the same year Kwangmyŏngsŏng-3 Unit 2 was successfully launched and brought into Earth orbit. The launches were controversial as they were dismissed by the US as tests of ballistic missile technology and hence of breach of an agreement made between North Korea and the USA in February 2012. During the 2018 North Korea–United States summit, Kim Jong-un promised that North Korea would destroy a missile engine test stand soon. The site was not initially named but was later identified to be the Sohae Satellite Launching Ground by US officials. This pledge was made official as part of the Pyongyang Declaration which Kim and South Korean leader Moon Jae-In signed at the September 2018 inter-Korean summit. Signs of construction were visible during the early 1990s and became more pronounced by the early 2000s. A major progress in the construction was discovered in 2008 by Jane's Information Group, which requested imagery from the satellite company DigitalGlobe. Movements from the Sanum’dong missile research factory with the erector transporter and railroad, road transportation to the space center of a prototype Unha-3 class booster first two stages initially took place over 29–31 May 2009 possibly for logistics testing as well as personnel facilities infrastructure testing training purposes. The results of those tests suggest that military and design specialists ultimately decided to build a facilities access railroad to cut down the 15 kilometer road access logistics issues to the space center. By early 2011 it was reported that the construction was completed and that it had been under construction for a decade. 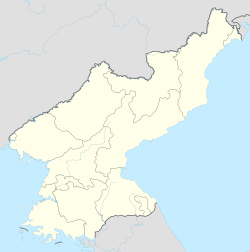 The first official mention of the site took place in March 2012 when North Korea announced it will launch from that site the satellite Kwangmyŏngsŏng-3. On April 2012, prior to the launch of the satellite, Jang Myong-jin, director of the Sohae, introduced the launching process of the Unha-3 rocket (Korean: 은하-3호, 銀河-3) during a guided media tour. The first launch of Kwangmyongsong-3 on 12 April 2012 failed. On 1 December 2012, the Korean Central News Agency announced that a second version of Kwangmyongsong-3 was to be launched from Sohae between 10–22 December 2012. North Korea declared the launch successful, and the South Korean military and North American Aerospace Defense Command (NORAD) reported that initial indications suggested that an object had achieved orbit. North Korea had previously claimed the Kwangmyŏngsŏng-1 and Kwangmyŏngsŏng-2 launches successful, despite American military sources confirming that they failed to achieve orbit. On 7 February 2016, North Korea successfully launched a long-range rocket, carrying the satellite Kwangmyongsong-4, from the station. Critics suggest that the real purpose of the launch was test a ballistic missile. The launch was strongly condemned by the UN Security Council. A statement broadcast on Korean Central Television said that a new Earth observation satellite, Kwangmyongsong-4, had successfully been put into orbit less than 10 minutes after lift-off from the Sohae space centre in North Phyongan province. North Korea's National Aerospace Development Administration stated the launch was "an epochal event in developing the country's science, technology, economy and defence capability by legitimately exercising the right to use space for independent and peaceful purposes". The launch prompted South Korea and the United States to discuss the possibility of placing an advanced missile defence system in South Korea, a move strongly opposed by both China and Russia. The entire facility occupies over six square kilometers, and consists of a launch site, a static rocket motor test stand, vehicle checkout and processing buildings, a launch control building, a large support area, a complex headquarters building and an entry control point. The site is five times larger than Tonghae Launch Site. There is much speculation about the functions of different parts of the site  but the nuances of satellite photography based guesswork may not be communicated effectively in the mass media. Western sources identified a building as a "high bay processing facility" which turned out to be the launch control centre when the site was visited by journalists. The building previously identified as the control centre was actually an observation point. In July 2018, North Korea began dismantling the Sohae Satellite Launching Station. Satellite images taken between 20 and 22 July showed the destruction of a rocket engine test stand used to develop liquid-fuel engines for ballistic missiles, space-launch vehicles and a rail-mounted processing building where space launch vehicles were assembled before being moved to the launch pad Commercial satellite imagery from 3 August 2018 confirmed that additional dismantlement activities were taking place at Sohae as well, including the destruction of facility's vertical engine test stand and fuel/oxidizer bunkers. In September 2018, North Korean leader Kim Jung-Un and South Korean leader Moon Jae-In signed the "Pyongyang Joint Declaration of September 2018", which, among other things, pledged for North Korea to complete its dismantlement of Sohae and allow foreign experts to observe the dismantling of the missile engine testing site and a launch pad. By 10 October 2018, commercial satellite imagery confirmed that the site's legacy fuel/oxidizer bunker located at the launch pad had been largely removed. Officials from South Korea's National Intelligence Service who visited the site on 31 October 2018 stated that Sohae was in fact being dismantled and was ready for an upcoming international inspection. However, days after the 2019 North Korea–United States Hanoi Summit ended in February 2019 without an agreement, new open-source satellite images showed that the site was undergoing reconstruction and appeared operational. ^ "DPRK to Launch Application Satellite". Naenara Times. 17 March 2012. Retrieved 12 April 2012. ^ "Kwangmyongsong-3 Ready to Launch". Korean Committee of Solidarity with the World People. 29 March 2012. Retrieved 12 April 2012. ^ "DPRK's Satellite Launch Not Contradictory to DPRK-U.S. Agreement — KCNA". Korean Central News Agency. 20 March 2012. Retrieved 12 April 2012. ^ Spetalnick, Matt. "U.S. identifies North Korea missile test site it says Kim committed..." Reuters. Retrieved 21 June 2018. ^ Maresca, Thomas (19 September 2018). "North Korea agrees to dismantle missile test site as Kim Jong Un, Moon Jae-in sign deal". USA Today. Retrieved 14 January 2019. ^ Laurence, Jeremy (17 February 2011). "North Korea completes second missile site". Reuters. Retrieved 11 April 2012. ^ Allen, Emily; Cooper, Rob (10 April 2012). "Fears North Korea are preparing to carry out a new underground nuclear test". Daily Mail. Retrieved 12 April 2012. ^ "Foreign Media Persons and Experts on Space Science and Technology Visit Sohae Satellite Launching Station". Naenara Times. 9 April 2012. Retrieved 12 April 2012. ^ Christy, Robert (1 December 2012). "Kwangmyongsong 3-2 Launch". Zarya.info. Archived from the original on 8 January 2013. Retrieved 1 December 2012. ^ "North Korea reports successful launch of controversial rocket". MSN/NBC. ^ "NORAD acknowledges missile launch". North American Aerospace Defense Command. 11 December 2012. Archived from the original on 14 December 2012. Retrieved 12 December 2012. ^ Encyclopedia Astronautica. "1998.08.31 - Kwangmyŏngsŏng 1". Retrieved 15 December 2012. ^ "N.Korea says it successfully launched satellite". Reuters. Retrieved 15 December 2012. ^ United States Northern Command. "NORAD and USNORTHCOM monitor North Korean launch". Archived from the original on 17 October 2012. Retrieved 15 December 2012. ^ "North Korea space launch 'fails'". BBC. Retrieved 15 December 2012. ^ a b "DPRK announces successful launch of Kwangmyongsong-4 satellite - CCTV News - CCTV.com English". english.cntv.cn. Retrieved 7 February 2016. ^ "UN Security Council vows new sanctions after N Korea's rocket launch". BBC News. Retrieved 7 February 2016. ^ "U.N. Security Council condemns North Korea launch - CNN.com". CNN. Retrieved 7 February 2016. ^ Gayle, Justin McCurry Damien; agencies (7 February 2016). "North Korea rocket launch: UN security council condemns latest violation". The Guardian. ISSN 0261-3077. Retrieved 7 February 2016. ^ a b "North Korean rocket puts object into space, angers neighbours, U.S." Reuters UK. Retrieved 7 February 2016. ^ "China worried over US-South Korea plans to deploy THAAD missile system - The Economic Times". The Economic Times. Retrieved 7 February 2016. ^ "Korea says THAAD 'helpful' to security". koreatimes. Retrieved 7 February 2016. ^ Song Hang-So (11 April 2011). "N. Korea finishes new missile facility: reports". The Korea Herald. Archived from the original on 5 January 2013. Retrieved 11 April 2012. ^ a b Oberg, James (9 April 2012). "Clues about North Korea's space plans come to light at last". MSNBC. Retrieved 12 April 2012. ^ "North Korea appears to be dismantling satellite launch site". www.cbsnews.com. ^ "More Progress on Dismantling Facilities at the Sohae Satellite Launching Station - 38 North: Informed Analysis of North Korea". 38 North. 7 August 2018. ^ a b CNBC (31 October 2018). "North Korea reportedly readies nuclear, missile sites for inspectors". www.cnbc.com. ^ "North Korea's Sohae Satellite Launching Station: Activity at a Launch Pad Fuel/Oxidizer Bunker - 38 North: Informed Analysis of North Korea". 38 North. 10 October 2018. ^ Joseph Bermudez; Victor Cha (5 March 2019). "After Hanoi Summit: Rebuilding of Sohae Launch Facility". Center for Strategic and International Studies. Retrieved 6 March 2019. ^ Sang-Hun, Choe (5 March 2019). "North Korea Has Started Rebuilding Key Missile-Test Facilities, Analysts Say" – via NYTimes.com. ^ Gordon, Michael R. (7 March 2019). "North Korean Missile Site Appears Operational, Images Show" – via www.wsj.com. This page was last edited on 28 March 2019, at 09:03 (UTC).